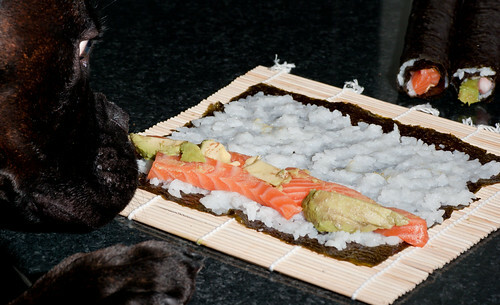 Today I'm making sushi. In preparation I have charged two sets of batteries for the flash and exchanged the 35mm for the 90mm f/3.5 Voigtländer lens. 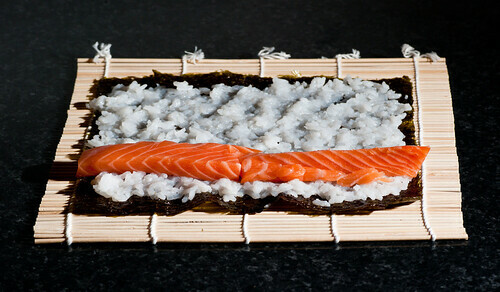 Half the point of making sushi today is photographing sushi being made. 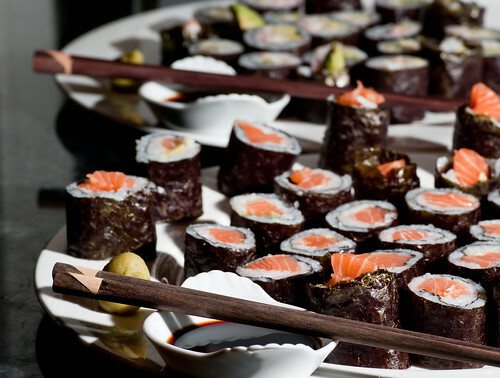 The quality of the sushi depends almost only on the quality of the fish. Salma salmon is a farmed salmon that is killed and filleted immediately to prevent any gut parasites from entering the meat. Therefore you don't have to freeze it before using it for sushi, which makes for much better fish. For variety I usually make two kinds of maki; salmon, and shrimp. Getting other kinds of sushi grade fish in Norway is all but impossible unless you are a resturant. Once you have the fish, you need to make rice. Very easy, do as it says on the sushi rice bag. Wash, cook, add sugar and vinegar, spread out on a plate to cool down. 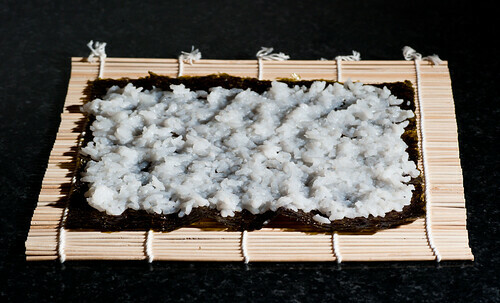 Spread a thin layer of rice onto a sea weed sheet, or sushi-nori. It should be really thin otherwise it will just taste rice, which kind of defeats the purpose. Cut pretty pieces of fish, shrimp and some avocado in this case. Don't give it all to the dog, even though she's so cute when she begs. Add a string of fish and some wasabi paste on the rice and roll it up tight. 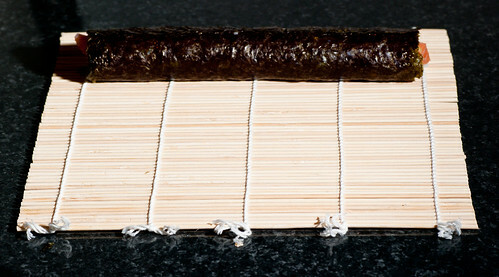 The special maki sushi bamboo mats are ideal for rolling, but anything flexible will do in a pinch. The difficult part is to roll the maki hard enough, so that it holds together. Wet the end of the sea weed to glue the roll shut, and make some three or four rolls per person. Cut into bite sized pieces and serve with more wasabi, japanese soy sauce and pickled ginger (called sushi gari). A cheap Danish beer is never wrong, otherwise a Sancerre or just water is also fine. Worst or best job ever?